While I have only ever seen the original Rocky (1976) and the spinoff/reboot Creed (2015), I’m still aware of some of the details of the Rocky franchise as a whole. I know who some of Rocky Balboa’s (Sylvester Stallone) opponents were over the years, including James “Clubber” Lang (Mr. T) and Ivan Drago (Dolph Lundgren). 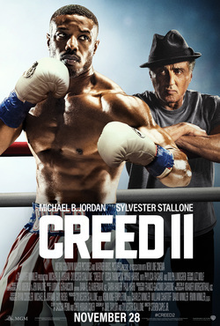 Consequently, even though Creed felt like it took the franchise in a new direction by focusing on Apollo Creed’s (Carl Weathers) son, its sequel, Creed II (2018) felt too steeped in the franchise’s history and nostalgia to be anything more than a rehash of Rocky IV (1985). If anything, having Apollo Creed’s son, Adonis (Michael B. Jordan), face off against Ivan Drago’s son, Viktor (Florian Munteanu), as a revenge match that followed the same plot points as its predecessor smacks of lazy and clichéd writing. I would have been much more interested in this film if, even despite all the training each son endured, the outcome would have been different than before. Pulling out all the recognizable bits from past Rocky movies makes it seem like there’s not many more rounds this franchise can go before falling to the mat. I will applaud the filmmakers’ restraint for not including that weird robot that was in Rocky IV, but a lot of the sentimentality and overly dramatic sub-plots seemed like they were trying too hard to get an emotional response from the audience. Fortunately, the boxing in this film looks brutal, a testament to both the choreography and training of the actors to make the fight seem so real. It’s probably not anything more special than what Creed had in terms of cinematography, but if you’re looking for a boxing match that doesn’t require pay-per-view, this movie can fit the bill. An OK sequel that relies way too much on nostalgia, I give Creed II 3.5 stars out of 5.